Joce Mienniel is a unique flutist who is adept at sharing the emotions of his inner world in a hypnotic, electrfied voice. He had been trying to extend the exploration of instrumental music into more unknown fields, and try to construct a cinematic, pure and full aesthetic concept for several years now. Nominated to French jazz Grammy Awards Victoires du Jazz 2016 as Revelation of the year. TILT, Joce Mienniel's new band, is an ideal playground, unexpected and very personal, which reveals his inner imaginary, giving freedom to an expressive sensuality. If there had to be deep and intense night blue. With their unique paths and musical influences, the four musicians draw on inspirations such as progressive rock, jazz, trip-hop, while remaining driven by one and only goal: immersion in sound experimentations. 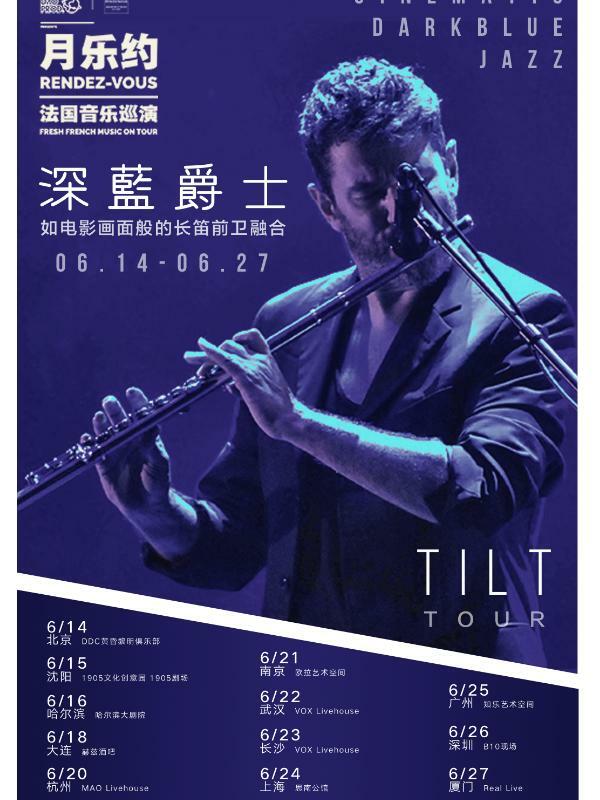 TILT is Joce Mienniel's extensive album collection, a sensible mix of film scores and jazz, world music and classical. Joce Mienniel says his explorations of the various shades of black open his art to a kaleidoscope quality of the TILT project. Joce Mienniel surrounded himself with very singular musicians in their way of playing and approaching their instrument. Sébastien Brun is on the drums. Powerful, it releases at each impact a feeling of earthly gravity as its striking is precise and heavy. Guillaume Magne is on the guitar. His wide sound and worked around the feedback is an essential element that Joce Mienniel wanted to associate with his music to accentuate this sensation of distant extended landscape. Finally, Vincent Lafont is on Fender Rhodes, which works the sound texture and builds a real narrative plot.